Given its ideal climate, rich historical and cultural heritage, proximity to Mexico City, and array of recreational sites, Cuernavaca has become the most important center of language training in Latin America. 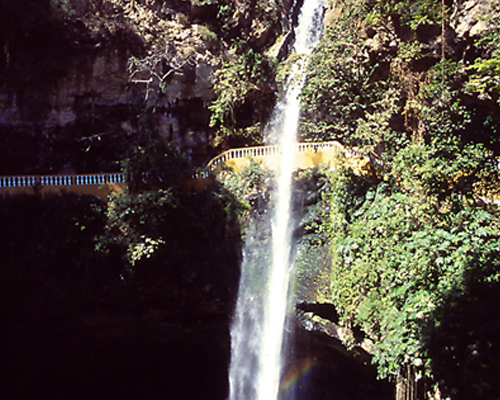 The year-round perfect climate in Cuernavaca has earned it the nickname "the City of Eternal Spring", baptized by Alexander Von Humboldt in 1803. Because of its fabulous weather, famous international personalities throughout ancient and modern history have chosen Cuernavaca as their home. Cuernavaca has existed since Neolithic times when it was named “Cuauhnahuac” by the Tlahuican indigenous groups that inhabited the area. Our city has weathered every important epoch in the history of the New World from the Spanish conquest to the Mexican Revolution. Cuernavaca offers countless restaurants, bars, salsa dancing clubs and spas as well as tennis courts, golf clubs, and swimming resorts. Cuernavaca is only an hour away from Mexico City, one of the most sophisticated and cosmopolitan cities in the world, and three hours from Acapulco on the western coast of Mexico. In addition, there are plenty of interesting towns and recreational sites in and around the state of Morelos where Cuernavaca is located –all within a day’s reach. Discover another part of your world. Discover Mexico! These are images of places in and around Cuernavaca that you can visit during your stay. Cuernavaca's Cathedral. 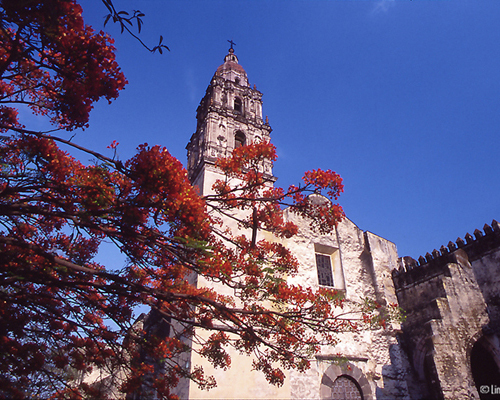 Formerly a Franciscan Monastery, Cuernavaca's Cathedral is situated just a couple of blocks from the town square. San Anton. Trails along river with two waterfalls, the larger with a 40 meter drop. Both of them are near downtown Cuernavaca. Xochicalco ruins. Its underground solar observatory is one of the principal attractions for visitors to this archeological site. Teotihuacan ruins. 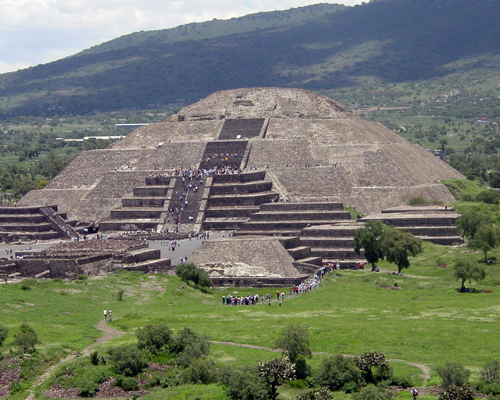 Teotihuacan is the largest known pre-Columbian city in the Americas. 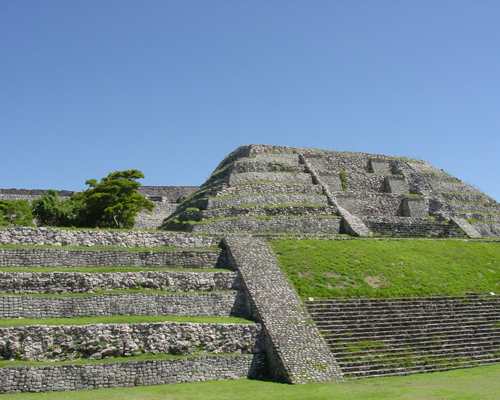 This huge archaeological site covers more than 19 square miles and contains some of the largest pyramids ever built. 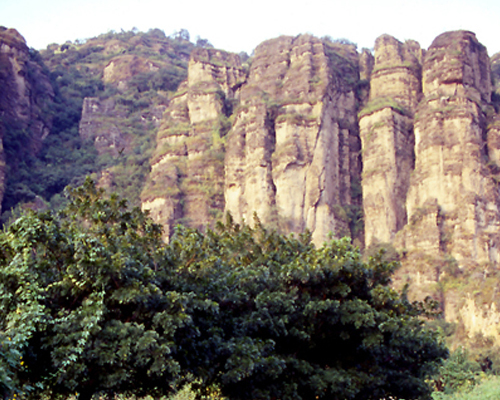 Tepoztlan. Tepoztlan, which means "place of abundant copper", is a small town nestled between craggy cliffs located in the State of Morelos. Taxco. 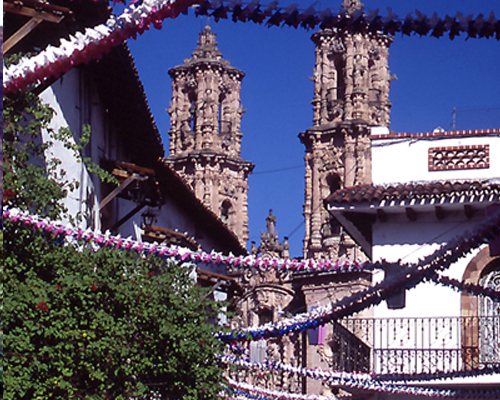 Taxco is famous for its beautiful colonial architecture, silver jewlery and narrow cobbled streets. Chapultepec Castle. 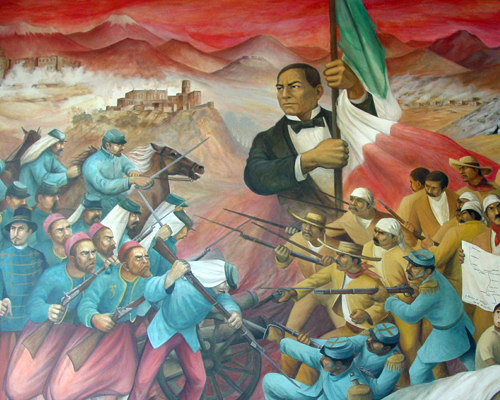 This image of Benito Juarez, a Mexican president and hero, is found in Chapultepec Castle in Mexico City where many important events have taken place throughout our history. 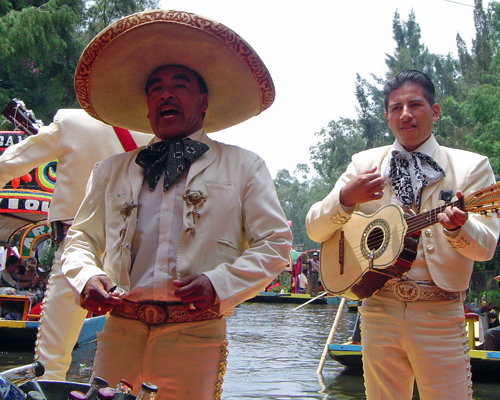 Xochimilco's mariachi. If you visit the gardens of Xochimilco you can ride on one of the flowered trajineras and enjoy mariachi music from the bands that float by while you have a picnic. Mariachi bands originated in southern Jalisco in the nineteenth century and are now popular world-wide.